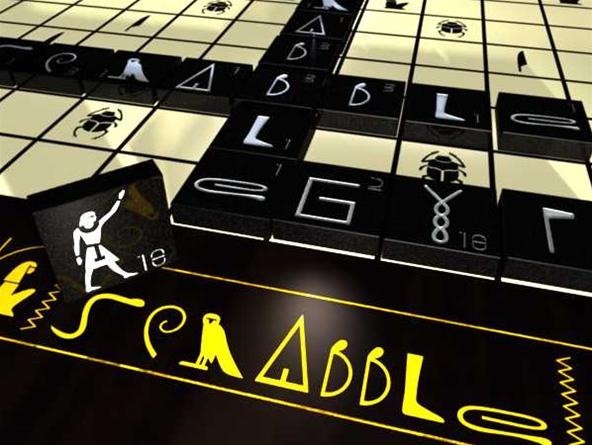 This Blender graphic shows my idea of an Egyptian style Scrabble board, inspired by the ancient board game Senet. It features the Nefertiti (Latin) font, so you don't have to read hieroglyphs to make words. The white hieroglyphs on the black granite tiles was inspired by inscriptions on Egyptian statuary of the same material. Wow. This is pretty awesome. You made this in Blender? You should submit this idea to Hasbro... they seem to like to making themed Scrabble boards (i.e. Gardening, Simpsons, Star Trek, etc. ).